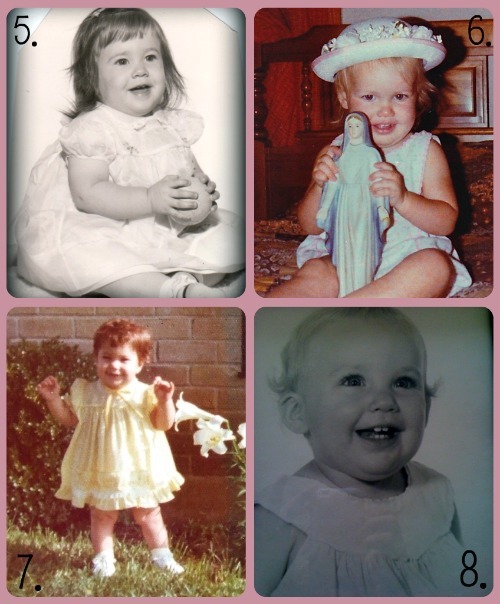 Shower of Roses: Name that Baby :: Catholic Cuisine Edition! You can scroll through some current pictures on the new Meet the Contributors page at Catholic Cuisine! 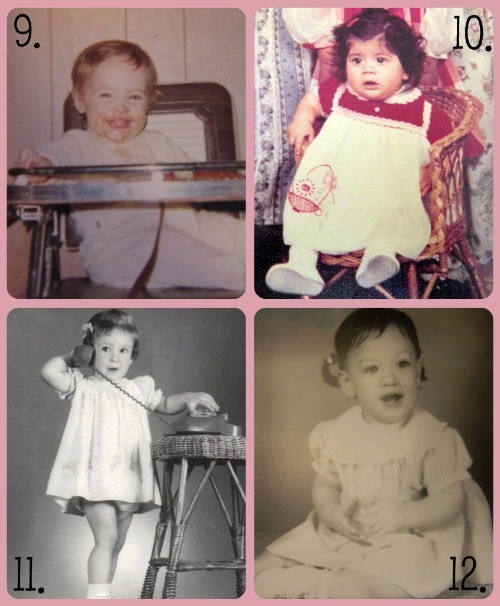 The first person to correctly identify each of the bloggers pictured above will win a beautiful St. Therese apron donated by Catholic Embroidery! Mary just created this new design inspired by this Virtual Baby Shower!! I think it is perfect! 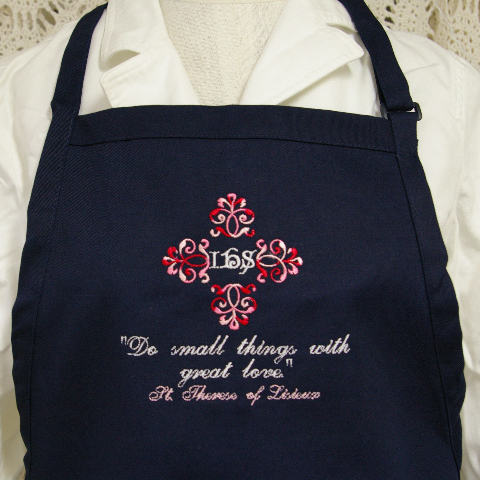 If anyone would like to order one, it is also available for purchase at Catholic Cuisine. Thank you Mary! If we end up having more than one correct answer, the apron will go to the first contestant to answer correctly, and the remaining correct guesses will be entered into a drawing for a second place prize, a set of Measuring Cup Matroyshkas, which I will send to the winner! Please number your guesses from 1-16, with the name of the blogger following the number. Great job Jessica! Wow, I can only tell a couple, and one of them is me! 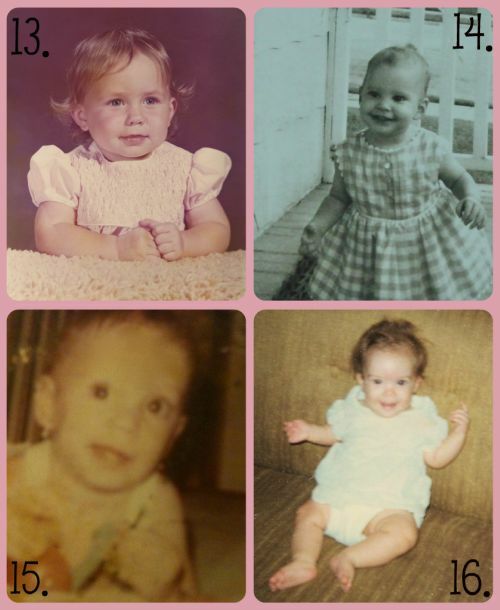 I can see the resemblances in many of the pictures, but then I know who each one is!! :) Just try your best, and if no one is able to guess them ALL correctly, the prize will be awarded to the person with the most correct guesses! Thank you all for your patience! I added that last picture that arrived this morning from a Catholic Cuisine Contributor and everything is updated. Here is the first guess that was just emailed to me by one of the Catholic Cuisine Contributors! 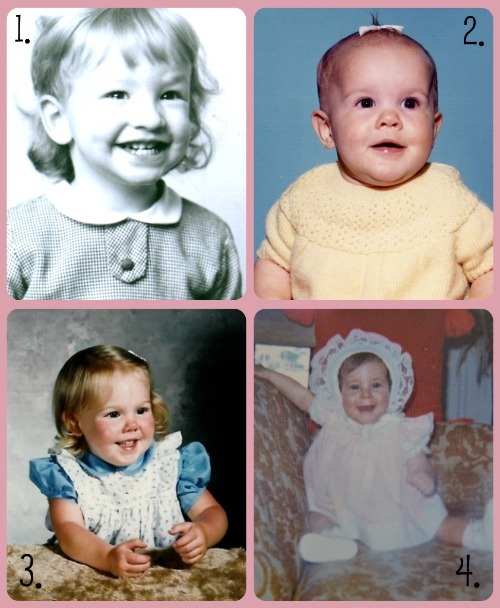 Here are my guesses.. this was very hard.. some people do not post their own faces.. I have to say that Charlotte is cheating, since there are NO pictures of her anywhere. That was harder than I thought, but hopefully I got more than myself right! Now Charlotte is lovely! Why does she hide herself? That is it, Mrs. Charlotte, start posting pics of your pretty face! Here are the guesses from another Catholic Cuisine Contributor! Whether I win or not, this has been a ton of fun! Thanks, Jessica! Thanks for the fun game, Jessica! Can't wait to find out the answers. God bless you sweet Charlotte, Cupcake and family!!! Enjoy every minute of your new miracle!!!!!! OK, I'm still working on this...didn't you say Charlotte was pictured twice? OK.....I was convinced I found 2 "Charlottes"!!LOL!!! I don't envy you having to correct all these! What a fun game, thanks so much Jessica! Another Catholic Cuisine Contributor...Jessica, I'll email you and let you know who I am. Thank you all so much for playing along! It has been so fun to see your guesses. No one was able to guess everyone correctly, but a couple of you got pretty close. I'll be back later with the answers and to announce the winner.